The Catland Chronicles: A Retrospective of My Recent Work by Lydia. ( ~---^..^ All Rights Reserved So, Like, Ask If You Want to Use it!! Okay, so anyways, as you probably already know (and if you don't you should definitely, like, read my thread) I am hoping eventually to become a professional Artist's and Photographer's Model because I have certain unique points, but am also a sensitive artiste and poet in my own right. During my last life, the lady who lived with me (no man that time around) was a "Beatnik" and we were all "Art Poetry Late Nights and Hashish [<high-powered catnip], Man," which the lady I live with now doesn't approve of, but which was fun while it lasted though it was hard to get any work done. So I am trying to use this life to, like, develop my special skills and realize my full Catfulness which Sam says is the duty of every cat (besides, like, sleeping 20 hours a day so we can connect with the Essential Self and Our Secret Name and stuff). Whatever, I love making pictures and the lady I live with now is pretty good at taking direction unlike the last one who spent all her time as an artist's model (which is how I learned!) and lounging in bed and stuff. So anyway, here is the first of my recent compositions.I have done a few self-portraits as you will see, but when I am Creating instead of Posing I prefer to use other Cats as models which means as a practical matter I'm stuck with Sam and Blobbo (Flat Cat to you). You can see that the Cat (really Sam but the average Viewer doesn't know that) is alert and focused and yet very Bored which Sam says is a Blessed and Mystical State because when you are bored your mind is empty and you can get in touch with your true secret self etc. but is also a melancholy state because you realize that you're drifting loose in the stream of Being instead of, like, connected directly to the Mother Cat and so on. Anyways, this is Sam in a state of being Bored but very mystical and about to be connected and stuff. (When I was a Beatnik I was more into that stuff but now being bored just bores me so I make pictures instead). The lady said it reminds her of one of her favorite painters (other than me), Pierre Bonnard. Ooookay. Considering that this is how he drew a cat, I am not too flattered but, like, whatevs. This next picture also uses Sam as a model and is called "Prayer Posture" because he was doing his Cat Yoga Exercises. This particular pose is the first step where you, like, bow to Mother Bast and the memory of the Great Hall. Give him this, Sam is very good at Yoga. You have to get your feet positioned just right and remember not to let your head go too low because, like, a Cat is Respectful but never, like, .humble. It probably looks easier than it is. I haven 't really, like, mastered it yet even though I am very graceful and you can just imagine what El Blobbo looks like when he tries. 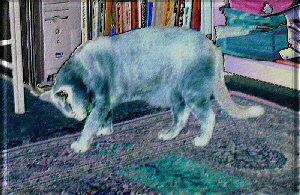 Anyways, notice the delicate coloration reflecting the blue aura of the Cat who truly has connected with his true spiritual Self. Notice also the cool colors I used for the junk the lady and the man put on shelves. The lady said the sort of purply pink bit was a Stroke of Genius and reminds her---yeah, whatever--- of some dude called "Matisse." 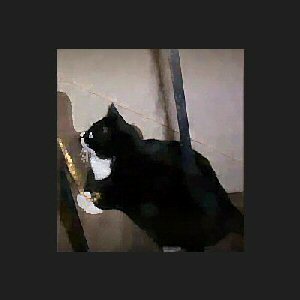 Anyways, I hope you get it too: even though I used Tuxedo Boy as a model, it isn't really him but is totally just a cat sitting on the stairs, being Expectant. And I thought the yellow ribbon thingie that the lady tied to the railings for us to "play with" like we are all some kind of kitten added an unexpected touch of color. This time the lady was reminded of "James McNeil Whistler", right, because everything I do always reminds her of something else. I used a Japanese brush technique to make him look less blobblicious and more like a real model. I was really pleased with the brushwork in the background because it looks sort of like, textured, and is a contrast to the shiny round cat. I made the railing look insubstantial on purpose so it would not detract from the, like, massive Blackness of the Cat's hindquarters but you could still tell it was a stair railing. 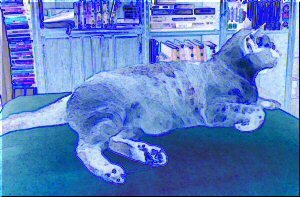 Next, I have a picture of Flat Cat that, like, expresses his true nature as far as I am concerned. When I told the lady what to do, she was all, "Oh my!" and then she started laughing. She said it was very creative but she was afraid it was Unkind. Whatever. 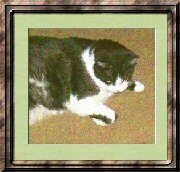 I am an artiste and part of an artiste's vocation is to expose the reality underneath the fat black and white cat. I called it "Krazy Happy" because it looks like he is laughing like a big cartoon cat looney. I used a mixed media technique with textured paint to make this come out the way I wanted it too. It is based on a Cat Clock with a tail that swings back and forth that the Beatnik lady I mentioned bought as a joke and hung on the wall. One reason Flat Cat is weird looking in real life is that besides having a stupid-looking short tail his eyes are really ROUND. What's that about? It makes him look like he is always surprised or, like, scared (which, he definitely is most of the time). I wanted to capture that but also, like, make him look slightly insane. Like, he is laughing, okay, but not in a good way. Like, you really wouldn't want to meet this cat in a dark alley some night because he is crazy and would slash you if you looked at him crooked. In the picture, my idea was he is laughing because he just ran up behind some unsuspecting sensitive cat and clawed her tail, then broke into the Bedroom (where we are NOT ALLOWED) and ate the lady's hamster (<supposed to be a secret but we all know all about her). 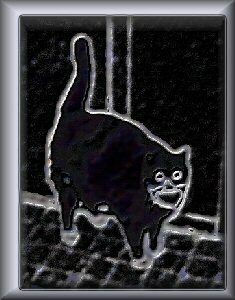 So though at first it fully looks like a picture of a stupid laughing cat it also is dark and like, disturbing. Finally, I made a picture called "Catnip Dreams" using a similar outlining technique but without textured paint or, like, so much use of the element of caricature and with more of a like, glowing neon effect and bevelling along the edges to make it look metallic. It is intended to convey the experience of catnip (though in real life it is not catnip just ordinary grass) and also to serve as a warning for cats who use it too much. I put myself in this one because I wanted the contrast to Flat Cat's Stoner Cat dude of an elegant, graceful artiste trying to use catnip to access her deepest instincts and yet you can tell from the way she is hunched over so she can scarf it down that she is, like, letting it use her. (Kits! Too much catnip is Bad for You and totally makes you stupid like Flat Cat! Lydia). Those are some great photos and what a great idea. You guys are very talented! Lydia, I LOVE all of your art works, you are very very very talented! I was going to tell you my favorite, but I can't decide. I was laughing and laughing and laughing when I saw the Krazy Happy picture! But I do not think you should call Flat Cat by the name of Blobbo. Because he would not like that very much.